Configuring your own micro SD card in order to install Raspbian on a Raspberry Pi is not so hard. Some of the instructions out there are a bit dated and make it out to be harder than it really is. For instance this site has some extra steps you don’t need: http://elinux.org/RPi_Easy_SD_Card_Setup. But all these instructions seem to refer to an IMG file which I don’t even see. The main thing is to download NOOBS (new out-of-box software) from https://www.raspberrypi.org/downloads/ . 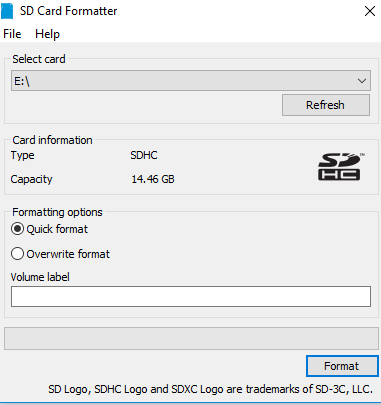 Then, get the SD card formatter. But the latest version is 5, not 4, and it looks different from before – there are essentially no options! So go with Quick Format and it works out OK. Unless your SD card is used. Then choose Overwrite format. That also works but takes a lot longer. Then when it comes to copying the image file, which makes no sense with NOOBS because the image file is hidden, I think. Just extract all the files form the NOOBs zip file and copy them over to your E: drive, of whatever drive your SD card appears as. Then follow the instructions on your Ras Pi display. That’s it! I know because I just did it. For the record, I’m in this situation because my old micro SD card just died. This is after running it continuously for a little over two years. Not very impressive in my book. Also for the record the card came as part of a Cana kit. – boot paused, then after 120 seconds spits out some warnings about MMC something or other. Note that the Etcher people were a bit lazy, and refuse to support burning NOOBS to an SD card with Etcher! to repeat, Etcher and NOOBS are incompatible. The stated reason is that NOOBS is not a true image. This entry was posted in Raspberry Pi and tagged Etcher, NOOBS. Bookmark the permalink. Yeah that looks like a useful SD card burning utility. Thanks for the tip!